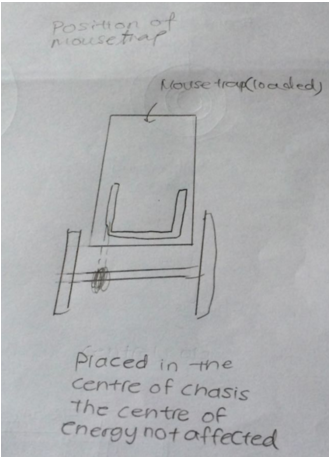 Will be able to hold the heavy mousetrap in place and also prevent the car’s body from breaking in the case of the lever arm snapping. It is made out of light materials hence it will not weigh down the car/ the wheels too much. It is relatively compact and small, having less air resistance when traveling. 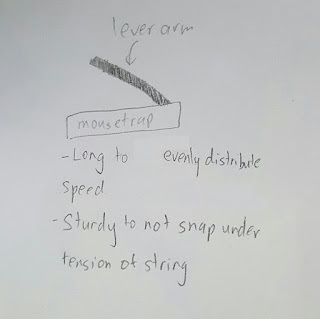 Long and sturdy : Must be able to increase the moment of the leverarm by reducing energy output per second; to prevent the snap of the leverarm. 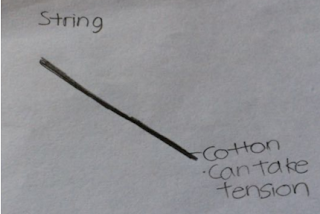 Long and strong : The string is made out of cotton which is strong enough to go under tension by the leverarm and not snap when the leverarm releases the energy from the mousetrap. Axles are straight, strong and sturdy (would not snap due to force of mousetrap). Must be a fit for the wheels. Must be light so as to not contribute to the weight of the car but at the same time, strong enough to hold up and rotate the wheels. Horizontally placed in the center of the chassis to ensure the that the center of gravity is not affected and the energy can be most efficiently harvested into kinetic energy. Was the car in steady and stable motion throughout? The car was pretty steady and stable compared to the first test run. The stability of the car was inconsistent. Was the car moving in a straight line mostly? The car shifted heavily to the right and stopped. The car shifted slightly to the right as it accelerated. Sometimes the car goes in a straight row while at times it tends to turn left and right. Observation 3: Did lever and string operate smoothly as well as expected? The string seems to have very little grip on the axle hence unwinded too fast. The lever flexed a bit but not so much hence the pulling force on the string was very strong causing the string to unwind even at a faster rate. The string unwinds the axles as it was intended to. Both the lever and string operated smoothly as expected. Add more structure at where the wheels are being fixed on axle. Change the axle to something that would provide the string a better grip and lighter so that the weight of the overall car would be lighter. As we figured that our car wouldn’t any travel any further or faster, we can’t afford to get violation points. Clearly, our lever was way too longer than the maximum length of the car. Hence we decided to shorten the length of the lever. 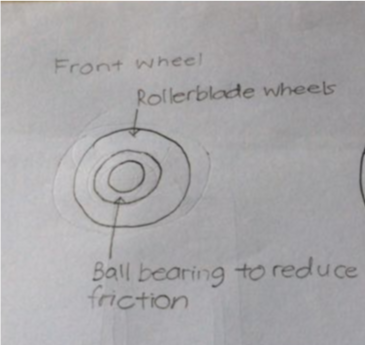 We realised that the car tends to left and right because the wheels are not that straight. 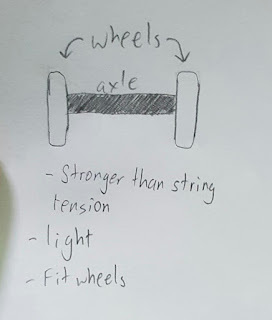 So we decided that we should add more structer on the wheel-axled fixed part as this will ensure that the wheels are strongly fixed on the axles. When the wheels are strongly fixed, we will lower the chance of them being unstraightened. We changed the axle and the rear wheels altogether. We used screw hooks as rear axle holders, single wodden stick as rear axle and 2 CDs as rear wheels. We shortened the lever by more than half of its original length. And shifted the front wheels back to the further back. The overall length of the car was at the maximum length of 30 cm. Though the car’s speed was affected a little bit we were able to avoid from getting violation points. We meted the hot glue that was used to fix the axle on the wheels and added ice cream sticks in layers which give the wheels a good binding on the axle. 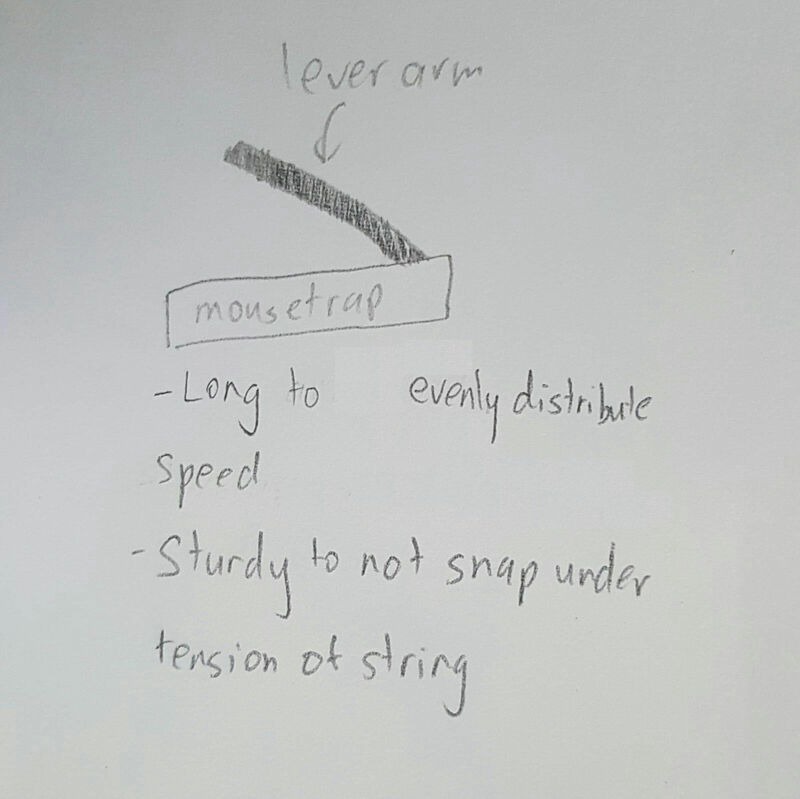 While we were experimenting with the positions of the lever arm, it broke. Hence, we changed the lever arm to a plastic stick which is 37cm long. It is able to flex more than the wooden leverarm hence it reduces the pulling force applied on the string which cause the string to unwind the axle at a slower pace. 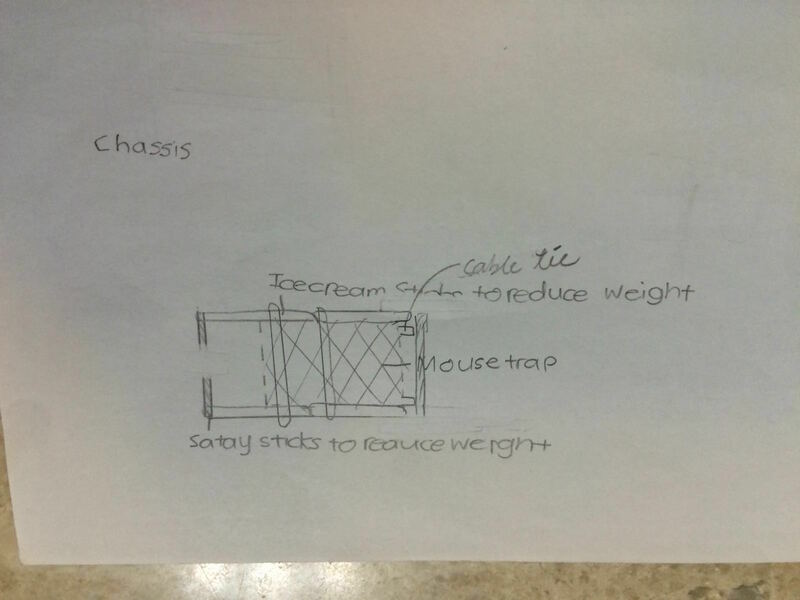 We wanted to slowly unwind the string as it would make the car to accelerate over time. We also realised that the wheels were actually contributing a lot on the overall weight of the car so we decided to replace them with CDs. CDs were much light altough the CDs give less stability, the light weightness covers up the efficiency of the mousetrap car. We added foam tapes on the rear wheels as the CDs as very little grip on the ground. While we were testing the “typres” of the wheels seemed to give too much traction. Hence the friction slows the car down when the lever arm can barely over come the frictional force. We decided to change the tyres into ballons instead of foam as ballon is made out of rubber which would still provide a good amount of traction. After we did many test runs, we also realised that the car does not travel straight because of its thin wheels. As we tried our car at the testing site, the car turns left or right even more often. This was due to the type of terrain the site is, the one which has many uneven areas. Hence causing our car with thin wheels to shift in direction extremely easily. We decided to change back the type of types used, back to the foam type as it would give the wheels a good amount of thickness.